Normal to Dry Skin: Enriched with apricot oil, peach and rice extract, plus oat kernal to stimulate procollagen production and promote cellular turnover, this anti-oxidant day crème is potent, yet light enough for everyday use. Aloe barbadensis (aloe vera) leaf juice*, helianthus annuus (sunflower) seed oil*, cetearyl olivate, sorbitan olivate, glycerine*, butyrospermum parkii (shea) butter*, rosa damascena (rose) flower water*, borago officinalis (borage) seed oil, populus tremuloides (aspen) bark extract, cetyl esters wax, sodium hyaluronate, prunus armeniaca (apricot) extract*, calophyllum inophyllum (foraha) oil*, avena sativa (oat) kernel extract*, oryza sativa (rice) extract*, malpighia glabra (acerola) fruit extract*, camellia sinensis (white tea), extract*, spirulina platensis (algae) extract*, triticum vulgare (wheat) germ oil, prunus persica (peach) extract*, rosa damascena (rose) flower oil*, tanacetum annuum (blue tansy) flower oil, anthemis nobilis (roman chamomile) flower oil, xanthan gum, rosmarinus officinalis (rosemary) leaf extract*, potassium sorbate. Fair-Trade ingredients must be used when possible. Rose - softens and nourishes skin. Apricot kernel oil - high in vitamin A; treats dryness. Oat beta glucan - stimulates collagen production; revitalising; protects against UVA rays; anti-inflammatory. Borage oil - restores moisture; highest gla source. Shea butter - moisturises and softens the skin. Linden blossom - freshens and softens skin; . Below are reviews of Rose and Apricot Antioxidant Day Cream - 30ml by bodykind customers. If you have tried this product we'd love to hear what you think so please leave a review. 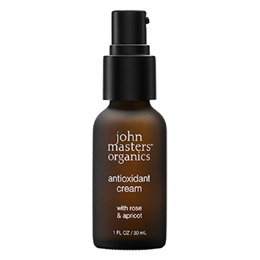 This antioxidant day cream is potent, yet light enough for everyday use. Enriched with apricot oil, peach and rice extract, plus oat kernal to stimulate procollagen production and promote cellular turnover.